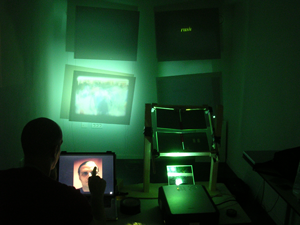 InterFace Portrait can be applied as an interaction model for interactive video storytelling. In fact, this is what it was conceived as when I began working on it at Tel Aviv university with Amnon Dekel, Udi Ben Arie, Mirit Tal and Maya Lotan. In this system, the interface portrait simulated character becomes a storyteller. A "memory" module is added, comprising a database of memory materials (connected by keywords and some narrative guidance elements). A story manager module then retrieves these materials according to certain overall narrative or other strategies, as well as according to the storyteller mood changes, which are the result of the patterns of user actions. The system aspires to create interactive experiences that maintain a delicate balance between a non-linear, significant and cinematic story; a character that also has a deep personality and is able to create a real sense of identification; and an intimate interactive experience as continuous as the gameplay of videogames and as immersive as good cinema. The original architecture was developed for One Measure of Happiness (2003), which was a single-screen display (intended for an elaborate installation setting which was not realised). It was an attempt to create a classical narrative film, yet in an interactive form. Have I Lost My Plot? (2004) was designed for multiple displays, creating a mental space within a dark physical space. On top of the narrative story representation option (which I found was difficult to follow), I added other story representation options. The choice between representation strategies then depended on the user's interaction style. This is further described in InterFace Portraits: Communicative-Expressive Interaction with a Character's Mind (pdf). You can view a Quicktime VR animation of the installation space, or a short Quicktime video of the September 2004 exhibition in Hilversum (requires, well, Quicktime). Upgrade! Tel Aviv hosted a presentation of this work in 2005. Read about the early stages in this article. You may also have a look at our design document. The latest article about the system is here.